Imagine visiting your favorite local park with a portable stove that’s 100 percent powered by the sun and heats up five times faster than a charcoal grill. Meet the SolSource Sport. 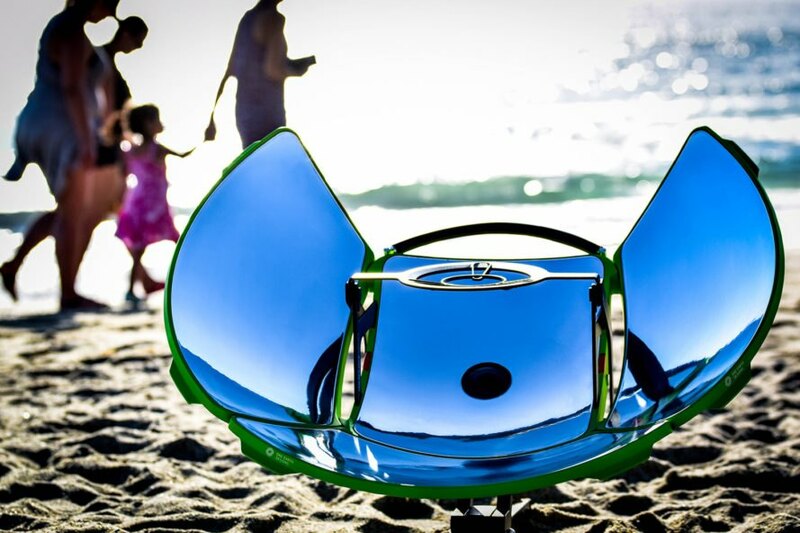 One Earth Designs is crowdfunding their latest compact solar cooker just in time for summer. The SolSource Sport focuses light onto cookware to get food sizzling and ready to eat super quickly. It can be used in places like national parks or apartment rooftops that don’t allow fires, because this solar cooker doesn’t need a flame to operate. With the versatile stove, you can grill, pan fry, boil, stir fry, or reheat meals. And you can use most of the cookware you already own instead of buying new pots or pans. The solar cooker gets up to grilling temperatures in a snappy five minutes, and reaches searing temperatures in 10 minutes. The SolSource Sport works in a variety of sun conditions – from one hour after sunrise to one hour before sunset, and in air temperatures between 30 and 100 degrees Fahrenheit. You can even cook in the snow as long as the sun is shining. And since sunlight is the only fuel necessary, the SolSource Sport doesn’t produce any carbon emissions. The surface of the solar cooker stays cool to the touch, making it safe to use. The stove pops up and breaks down in around five minutes, and it can be stored inside a two-foot-long carrying bag. One Earth Designs has already raised nearly $75,000 out of an original goal of $20,000 on Kickstarter. You can snag one of these affordable little cookers for under $200 if you’re fast (retail price is $249). 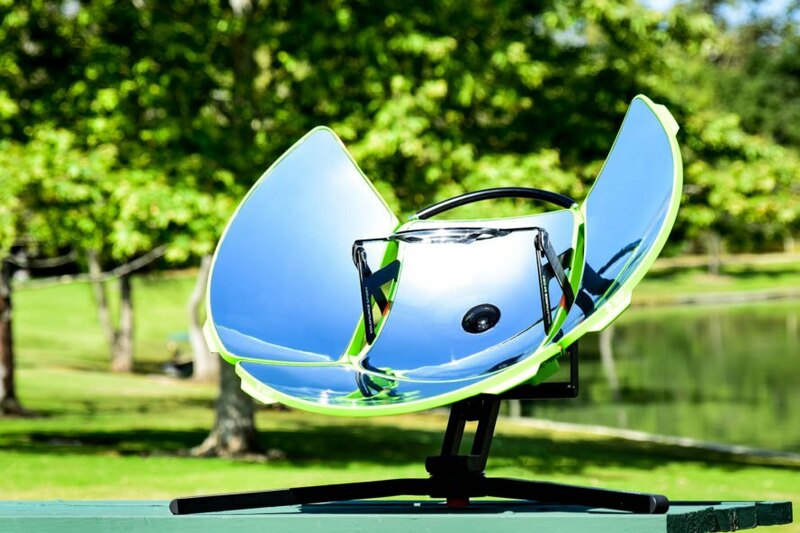 One Earth Designs is crowdfunding for their SolSource Sport solar cooker. One Earth Designs' solar cooker pops up and breaks down in around five minutes. 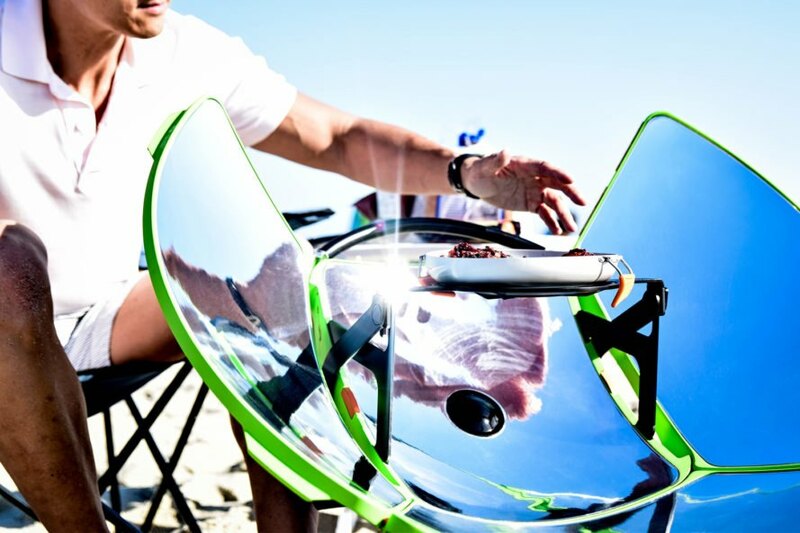 The solar cooker heats food simply with the power of the sun, producing no pollution. The SolSource Sport weighs only around 10 pounds.